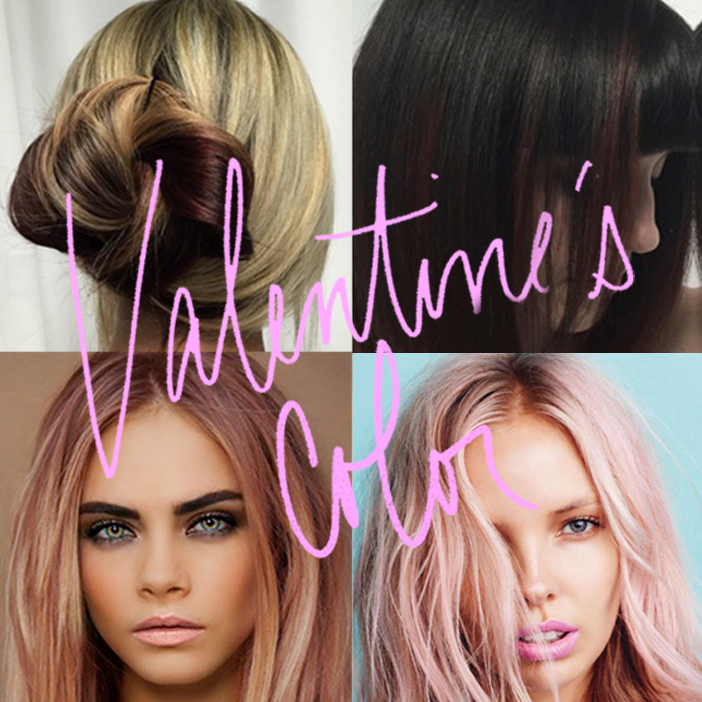 With Valentine’s Day right around the corner we wanted to share with you some of our favorite Valentine’s Day hair color formulas. These are a good variety of “LOVE” inspired hair color formulas that can cater to any client wanting either a subtle color for their special evening, or something a little more adventurous. For those looking for a quick change for the night with little commitment, giving them a color that can wash out quickly over time works great. 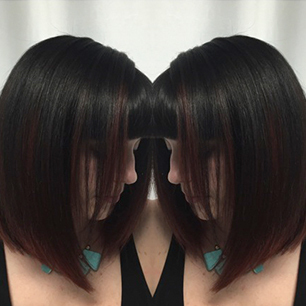 In this example, we wanted to add a little red copper to this level 7-8 balayaged bob. In order to give her this temporary color, we used a direct dye pigment from Davines and Colortrak’s Applicator Bottle. We applied the color at the shampoo bowl after shampooing and conditioning the hair. 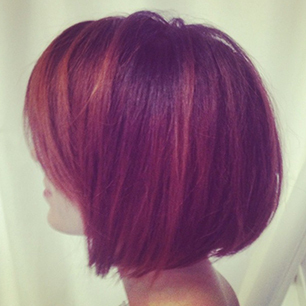 The result was an amazing burnt amber effect on this pre-lightened bob. Davines Finest Pigment, equal parts No.7, Red, Copper and Sand. A dark chocolate base works great as a canvas to add red accents, and gives the client the ability to change whenever they want. For this look we accented the hair by using a soft balayage technique using Colortrak’s Balayage Board, Brush and Haircoloring Film. We worked around the face, painting a strong amount of pre-lightened sections toward the ends. Base - Shades EQ Gloss, equal parts of 3V, 1B and Violet Kicker. 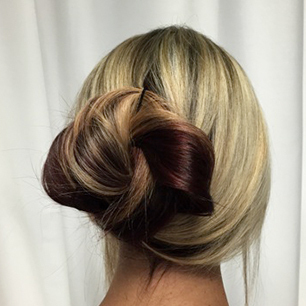 Try creating a pop of red that hides underneath the hair. You can then play up the style with a rose inspired up-do. When applying your red color for underneath, it’s a must to work with your Haircoloring Film to isolate the color from the blonde. Try working with a Pravana Locked in to insure bleeding when rinsing. Working over a natural level 7 we used Pravana Red with a ¼ Black to deepen the red for less brightness, and then add a dash of Violet for a Violet undertone. Rake your hands through the hair and begin to form the hair into a low pony tail. Twist the hair in a clockwise motion and begin to pin the hair down. Form the shape with your hand as you work and allow texture to form. Pin with 1 bobby pin. Washed out colors is a cool way to add a dash of color to blondes with a life span of two to three washes. It’s also a great way to increase retail revenue by creating customized conditioners for your clients to take home. 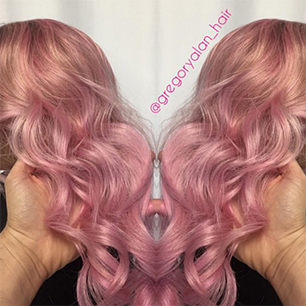 To create this “washed out” blush color, working on pre-lightened and highlighted hair, use a few drops of Magenta and Pink in the conditioner when conditioning your client’s hair at the shampoo bowl. You can easily do the same thing to their take home conditioner so that they can continue to extend the color further. What are some of your favorite low commitment, quick color formulas? Share with us! For more articles stalk Colortrak on Bangstyle and SUBSCRIBE to our mailing list!